I'm healing well and am back to doing daily chores but alas, I'm not allowed out in the garden for garden floors are notoriously uneven and a fall, now, would not be "a good thing". 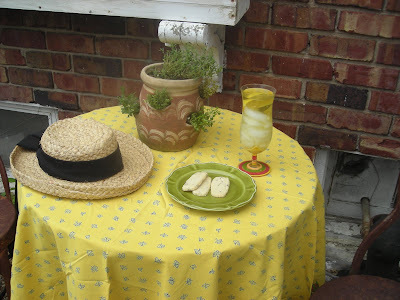 My stamina, too, is not up to par and so I've not had company for lunch or dinner and therefore, I'm reprising a post from last year -- a garden post for I do yearn to be outside -- I do yearn to sip a glass of tea and have a nosh in the garden. 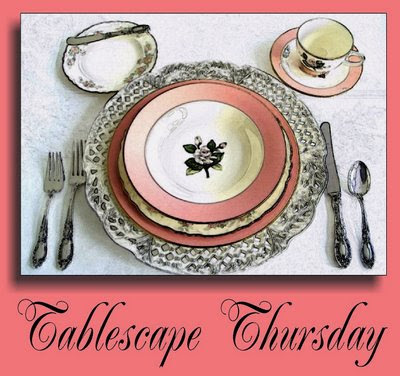 A great big thank you to Susan at Between Naps on the Porch for hosting Tablescape Thursday. It's always a fun event and I so love seeing everyone's tablescapes. Everyone is so creative and has such beautiful dishes and centerpieces! It's Spring at Linderhof and March means garden chores. All of those things that didn't get done in the fall (my Scarlet mentality -- tomorrow is another day -- spring is a long time away -- it's a beautiful Indian Summer day and I can go play) have to get done now! So hours spent out in the garden raking and mulching and doing all of those odd garden chores that are just no fun! But a respite is always in order . . . and today was no exception. 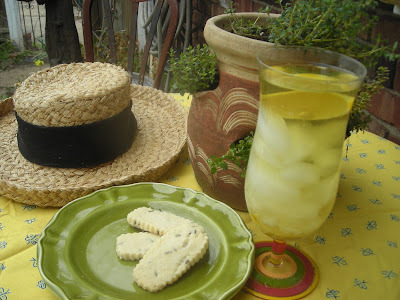 With freshly baked lavender cookies (from last year's lavender crop) and a glass of green tea, I could take off my garden hat and sit at "our" table -- the small table that we often sit at in the garden. The tablecloth is from Williams Sonoma and I have two -- one for each of the big tables but it works well on the little one. Some lavender cookies and tea -- what could be better even if you're hot and sweaty and with dirt under your fingernails. You just feel better when there is a cloth on the table and the cookies are on a plate! "Thyme in a Jar" is my centerpiece. 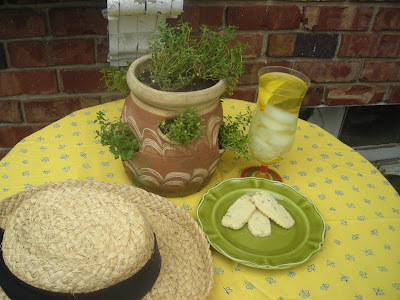 Put together for the herb class that I'm teaching tomorrow night -- seven different kinds of thyme -- all in a jar! Don't you wish we could bottle time and use it later! The wee strawberry jar was my mother's and I hold it dear. A small tablescape, this, my respite in the garden. But it is a busy week and company at Linderhof has been sparse although we hope to recitify that Friday! I am so happy that you're starting to feel better, but it's given us a chance to see some of your wonderful posts that I for one missed. Such a lovely spot! Beautiful! So glad to hear that you're doing well! I wasn't a blogger last year so it's so nice to see your re-post. Martha, you are being such a good patient! If there were prizes for taking care and obeying doctor's orders I'm sure you'd get something gorgeous in blue porcelain! 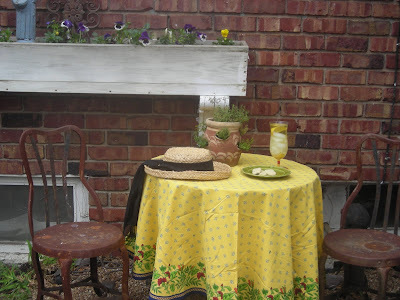 I love the garden table with the yellow cloth - a lovely retreat from the heat. Be careful!! Hope you heal fast. Love how the green plate looks so nice on the garden-y tablecloth. What a lovely spot! That tablecloth is so pretty. I hope that you get back to your garden soon. It is so hard to stay inddors when you are longing to go out. I hope your recovery continues to go well. What a fabulous spot for some rest and relaxation! Perfect for a gardening break. Hope you're back playing in the dirt soon. ooh it's quite inviting. I wish i could just come by, sit a spell and chat. Get well son. Your tablescape was very pretty. Such a lovely setting. Glad to her your recuperation is going well! The lavender cookies look delicious!